Do you despair at the quality of the chocolate available in Easter Eggs, and the lack of packaging for good chocolate that encourages gifting? Earlier this week, I shared how I scan Instagram, boutique stores and online shops for inspiration for all kinds of gifts. I use this inspiration, planning ahead, to create all kinds of loveliness to gift to my friends and family. You can see that post here. Here's an image I saw on Intagram this week. I do not know this chocolatier but I instantly fell in love with their packaging. 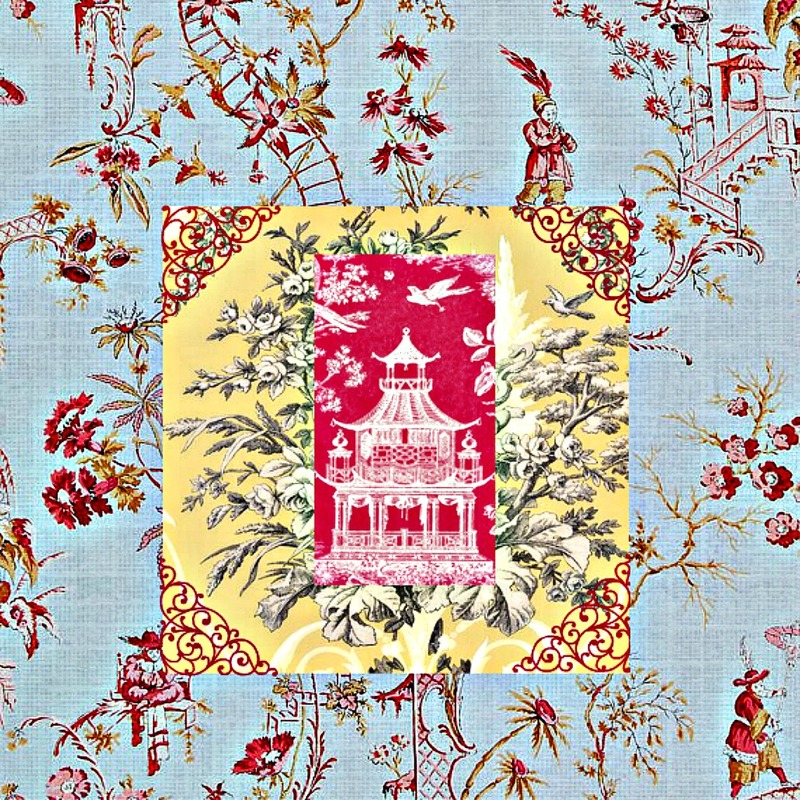 Feeling suitably inspired, I set about creating my own similar Chinoiserie Toile and Pagoda wrapper, using PicMonkey. I made sure I used old designs, that do not have copyright attached to them. 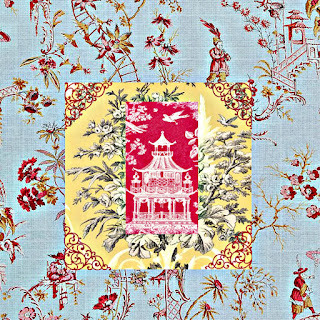 I used the Toile as my base image, overlaying the Pagoda in PicMonkey, and adding flourishes and a label reading Atelier Bliss. I ensured my colours were compatible with the colours in the toile, printed it off, and voila! I had my customised wrapper! Fortunately, an A4 sheet of paper is just the right size for wrapping a 100gm block of thin dark chocolate, so I was off and running. With minor adjustments to the positioning of the print, they will also fit a 200gm bar of chocolate. Remove the cardboard packaging from your block of chocolate and discard it. Leave the foil intact and turning it right side up, lay your sheet on the block of chocolate, lining it up so that the flourishes and labels are positioned correctly. I created this so that the flourishes finish at the edges top, bottom, and sides. Press along the edges to mark where you'll be folding the sheet around the chocolate. Decide whether you want to completely encase the chocolate like gift wrapping, or make a sleeve with a little foil peeking out top and bottom like the ones pictured. I chose to completely enclose mine. Trim the sheet to size, top and bottom, according to whether you're having foil peeking out, or enclosing like a gift. Now double sided tape is useful for this, but you can use a hot glue gun or craft glue as well, although it's a bit trickier. I had double sided sticky tape so I used that. Fold carefully along your creases and wrap the bar, so that the flourishes are all in place. Flip over and use the tape or glue to secure at the back. Flip over and check that all is straight and neat, then fold and finish as if gift wrapped if required, or if you're having a foil peek, you're done. 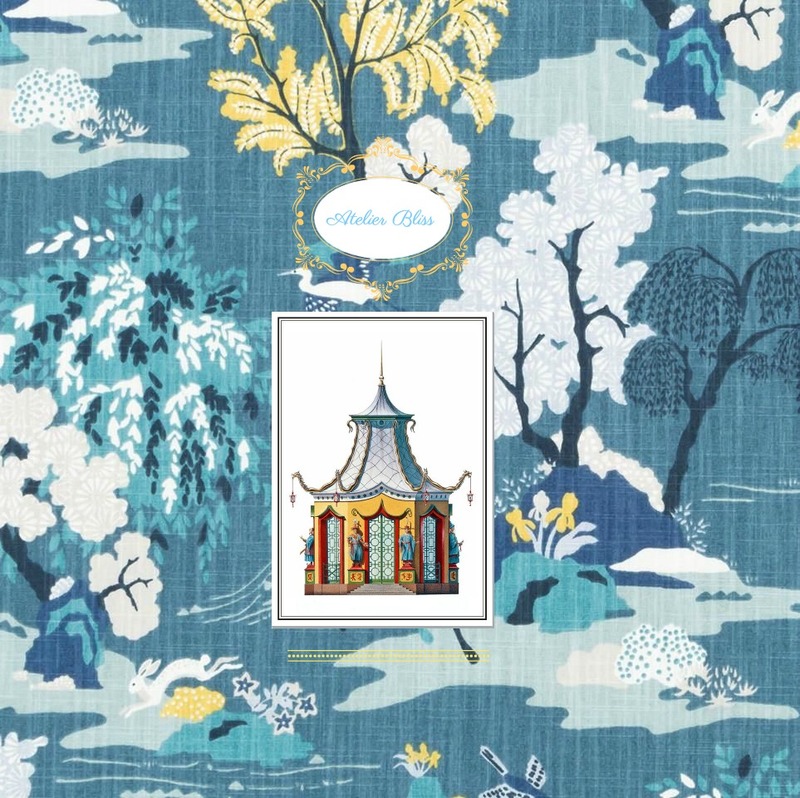 I even have customised ribbon printed with the name Atelier Bliss, so I used a length of that to add a final touch. I bought 50 metres three years ago, and it's still going! It's a useful idea to have little things like this as they really give your gifts a professional touch. You could also use Wedgewood Blue, Mint Green, Lemon, Tan or Gold ribbon as that would pick up the colours in the toile beautifully. Grosgrain or Velvet ribbon would be particularly nice. Even printed in black and white, with a simple black ribbon, this would look superb. I have given you free PDF downloads of four different luxury chocolate block sleeves, so that you too, can create your own special gifts. ... I was fortunate to have a roll of Washi tape that complemented this beautifully. I'm sorry I can't tell you where it came from. I picked it up in a bag of craft supplies at a thrift store, but I'm sure there are similar ones available. Note that this one is a little smaller, and will have white edges. I trimmed mine top and bottom to have the chocolate foil peeking out, but needed the sides to wrap and meet at the back of the chocolate bar. 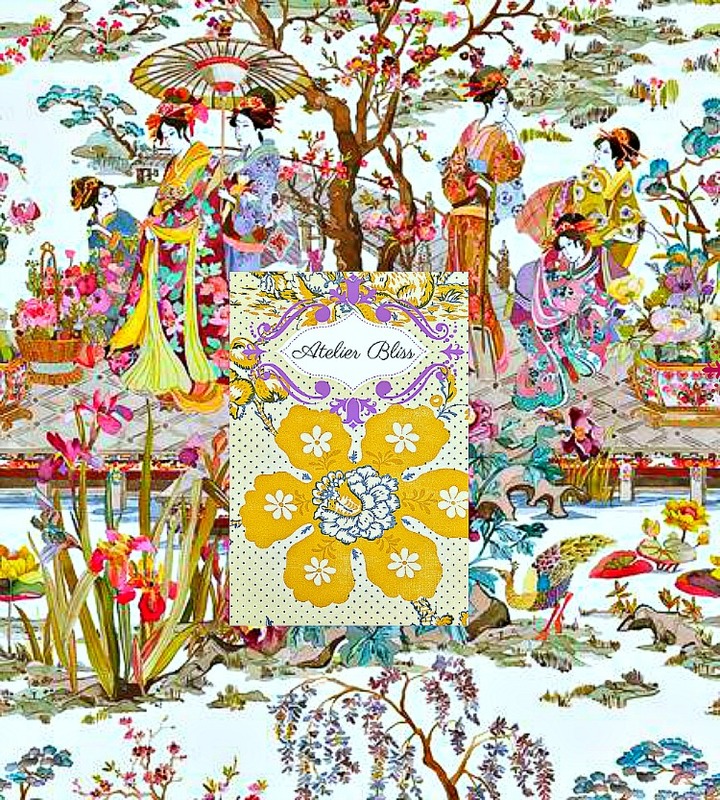 And the fourth features elegant Geisha girls and a pastel label. I highlighted this one with lilac spotted grosgrain ribbon. I can't choose a favourite! Note that colours may vary upon reproduction depending upon the view on your monitor, and the ink in your printer. Mine print out much paler than they appear on my own monitor, so be aware. Oh Mimi, these are so gorgeous and inspirational.I'll be busy tomorrow. Such a fun idea and they really are lovely! I love the one with the bit of pink! What a beautiful way to dress up a chocolate bar. Now and then I find pretty wrapped bars at T.J. Maxx or Home Goods. Thanks for sharing with SYC. These turned out so pretty, Mimi! I have done similar things with scrapbook paper that I get at the craft store. I think this goes back to the "thought that counts" way of thinking and turns an inexpensive chocolate bar into something special. 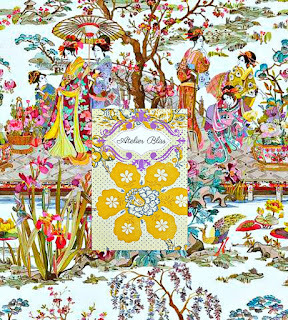 Your wrappers are beautiful!